I recently bought my first Omega watch. This post describes my experience with the watch so far (both things I love, and things I don't like as much). I own several dive watches in the 42-44mm range, but had been curious about owning something just a little smaller for a while. When Tudor announced the Black Bay Fifty-Eight (39mm diameter, 12mm thickness), I was intrigued by the measurements. I put down a deposit with the local AD to get one once they would start shipping. 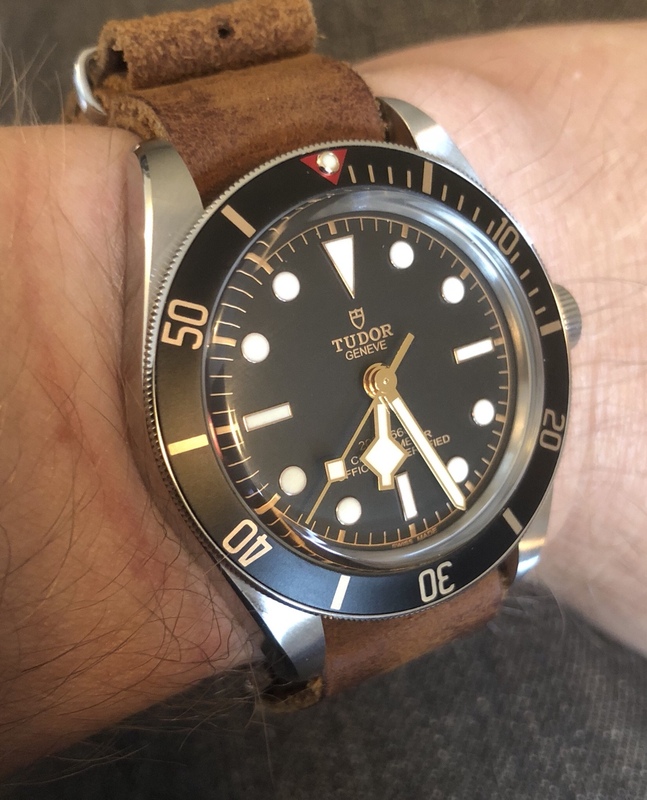 However, as the first real-world pictures of Black Bay 58s started appearing online (from folks in the UK where it started shipping a few weeks ago), I increasingly felt like the Black Bay's design wasn't quite for me. For starters, I wasn't a fan of the matt look of the aluminum bezel. I also felt like the heavily domed crystal wasn't really for me, the more pictures I saw. So I looked around for other alternatives. I had long been a fan of the Seamaster Planet Ocean's design, but had always felt like it was just too ridiculously thick, and also a little above what I was willing to spend for a watch. As I started looking into it more, I found that the 39.5mm version might be just the right size for what I was looking for. At about 14mm thickness (a value I had to search for online quite a bit - some pages list it incorrectly, and Omega doesn't seem to list case thickness at all), it is not a thin watch, but seemed to be within reasonable bounds. This was starting to sound good, but the watch was still a little pricey for what I was looking to spend. However, after a bit more search, I found that Jomashop had it on offer at a >30% discount compared to MSRP. The Jomashop price was not all that far above the price of the Black Bay which I had previously planned to buy. I was a little sceptical about buying a multi-thousand $ watch on the gray market. While Jomashop offers a 4-year warranty on this piece, I don't put much value on their warranty. However, given that a full overhaul by Omega is $550 per their price list, and comes with a 2 year warranty from Omega, I figured that in the worst case, if something was wrong with the watch after delivery, I could just immediately send it to Omega for an overhaul, and still save significantly compared to MSRP. Note that Jomashop does charge an 8% restocking fee for watches above $4,000. I only noticed this after my purchase. If I had known this before, I would probably have looked for another gray market seller with minimally higher pricing. Anyway, I ordered the watch (blue dial version), and it arrived within two days. The Planet Ocean comes in a heavy polished wood box. Very nice. The finishing of the watch is absolutely faultless. The lugs and case have a complex and very modern-looking shape, with a combination of brushed and polished surfaces. The watch sits well on my roughly 7 inch wrist, and I don't find thickness to be an issue in this version. The very slightly domed crystal looks great as well. One of the greatest part of this watch in my opinion though is the ceramic dial and matching bezel. The blue varies a lot depending on the light. In some light (including bright day-light), dial and bezel appear in a deep, strongly saturated blue. At other times, the they look almost grey. Overall, the ceramic dial, in combination with the polished hands and applied numerals and markers on the dial make the Planet Ocean look quite reflective, not to say blingy. It makes the watch look super interesting, though I could see it become a little much over time, especially on the bracelet (see below). The bezel itself feels very solid, and has a great click to it. I was a little worried that it might be hard to move with (dive) gloves on, but found that it's actually quite grippy and I was able to adjust it easily with 5mm Neoprene gloves on. I haven't had a chance to test it when wet yet (which can make a difference), so will report on that once I've had a chance to take it diving. The Planet Ocean of course has the hideous manual Helium escape valve. One problem with the manual valve in this version (I hear Omega recently improved this in their latest models) is that there's no good way to visually tell whether the valve is open or not. It is quite easy to leave it partially unscrewed accidentally. Omega claims that even when open, the escape valve is still water proof to 5 bars (50m). That's enough for everyday activities, which is good, but I wouldn't trust it when diving (even though I rarely even get to 40m when I do). As we all know, Helium escape valves are also a highly useless complication for practically everybody (I doubt there's a single person on earth with a 39.5mm Planet Ocean who is doing saturation diving, but could be wrong of course). Finally the lume is quite good. Not the strongest one I've seen, but perfectly useable, and maintains a charge throughout the night. I think it's pretty cool that Omega uses green lume on the minute hand and bezel pip, and blue lume on the markers and hour as well as seconds hand. However the colors are only really noticeable while the charge is fresh. Once the lume gets dimmer, I can barely distinguish the different colors anymore (but that's fine - more of a limitation of my eyes than of the watch itself). My phone's camera also had difficulty distinguishing the colors in low light. The effect is more visible in reality. One of the reasons why I find Omega watches so interesting is that they are quick to adopt new designs and technologies in their movements. The 39.5mm Planet Ocean comes with the Omega 8800 co-axial movement. This movement has a single barrel with a 55 hour power reserve. Instead of the independent adjustment for the hour hand that some of the larger Omega movements have, this one has the more common date quick set function. It comes with a silicon hair spring, as well as a silicon balance wheel, allowing it to meet the METAS Master Chronometer certification with extreme resistance to magnetic fields. Pretty cool. The date change at midnight is practically instantaneous with this movement. One of the things I really love about this watch is how nicely the movement is decorated. Interestingly, my watch is losing between one and two seconds per day. This is a little at odds with the METAS specifications, which require an average deviation of positive 0-6 seconds per day. While in the factory, my particular watch was tested at plus 1.5 seconds per day in the 6-position test. Another interesting feature - the watch comes with an NFC-enabled card that you can hold up to your phone. You can then retrieve the detailed master chronometer testing results from Omega's website for your particular watch. That being said, I'm more than happy with the minus 1-2 seconds/day precision that I'm seeing. The metal bracelet is undoubtedly of high quality. Finishing is good, and the clasp looks really solid and well manufactured. That being said, there were a few things I didn't like about this bracelet. 1. The endlinks do not blend seamlessly into the case. The curvature of the endlink is minimally different from that of the lugs, making the edge between the endlink and the lugs look uneven. It is also finished differently from the lugs. I suspect this might have been an intentional stylistic choice on the side of Omega, but I like the way Rolex's bracelets attach better in this respect. 2. No dive extension, despite this being a 600m dive watch. The larger diameter Planet Oceans do have a dive extension, but this one only has the tool-less micro adjustment. 3. About that micro-adjustment: The bracelet does not come with any half links. In my case, I was not able to adjust it in a way where the micro-adjustment was still useable. With the adjustment fully shortened, and an additional link inserted, the bracelet was much too long and the watch would slip onto my hand. 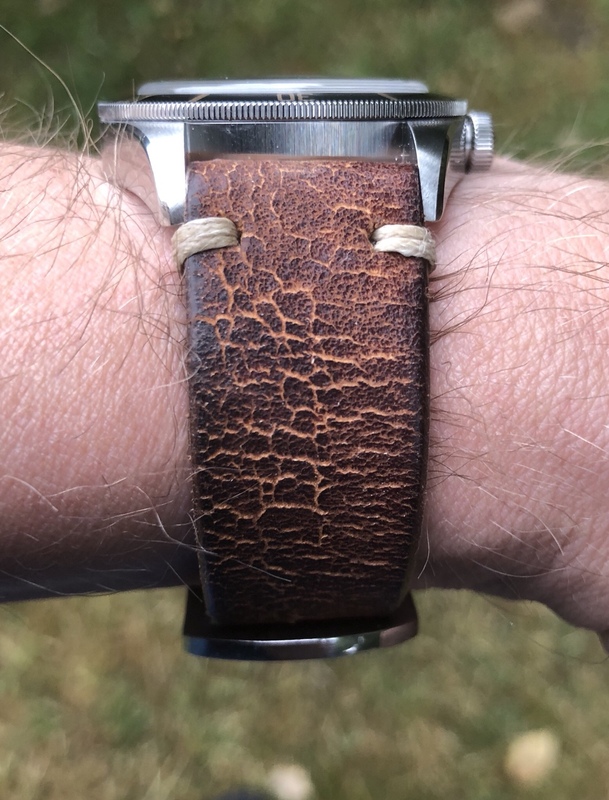 The the extra link removed, the only way I could halfway comfortably wear the watch was with the micro adjustment fully extended (it only has three settings). The benefit of being able to adjust the bracelet depending on temperature and humidity throughout the day got entirely lost for me, and the bracelet always felt slightly tight. 4. This is more of a problem with the watch itself than with the bracelet, but this version has the unusual 19mm lug width. Finding straps for it is difficult, and it feels a little unnecessary to have this odd size. Though see the next section for what I ended up with. 5. This is purely subjective of course, but I found that the bright steel bracelet (which doesn't taper by the way) was distracting from the watch itself on my wrist. Also, and this is primarily an issue of me not having the right tools - I found removing the screws for the bracelet links to be a huge pain. It literally took me 2-3 hours to adjust the bracelet, because I didn't have exactly the right screwdriver, and mine kept slipping from the extremely shallow screw heads. Similarly, removing the bracelet from the watch was really difficult as well with a regular springbar removal tool. I think there is a special tool for Omega bracelets that pulls out the spring bar on both sides simultaneously. It would have come in handy. Based on a post in https://omegaforums.net/threads/isof...ap-review.974/ , I concluded that the 20mm strap would fit fine between the 19mm lugs. I also ordered some high-quality 19mm / 1.8mm spring bars from Ofrei to use with it. See for yourself. I haven't had a chance yet to take pictures on the Isofrane in better light. It looks almost black on these photos, but is actually a dark blue. I think it looks very nice on the Planet Ocean. In fact I find it to give the Omega a more sporty, and significantly less dressy look, while maintaining, if not even emphasizing - the beautiful design and reflections on the watch itself. Something I really appreciate. Last edited by danielmewes; August 2nd, 2018 at 08:22. NMGE17, Ard, 8100 RPM and 15 others like this. Congratulations on a great watch! Thanks for the review and pictures. Fantastic write up. I had (and sold) the 42 mm P.O. for being just a bit too chunky for me so the 39.5 interests me quite a bit. 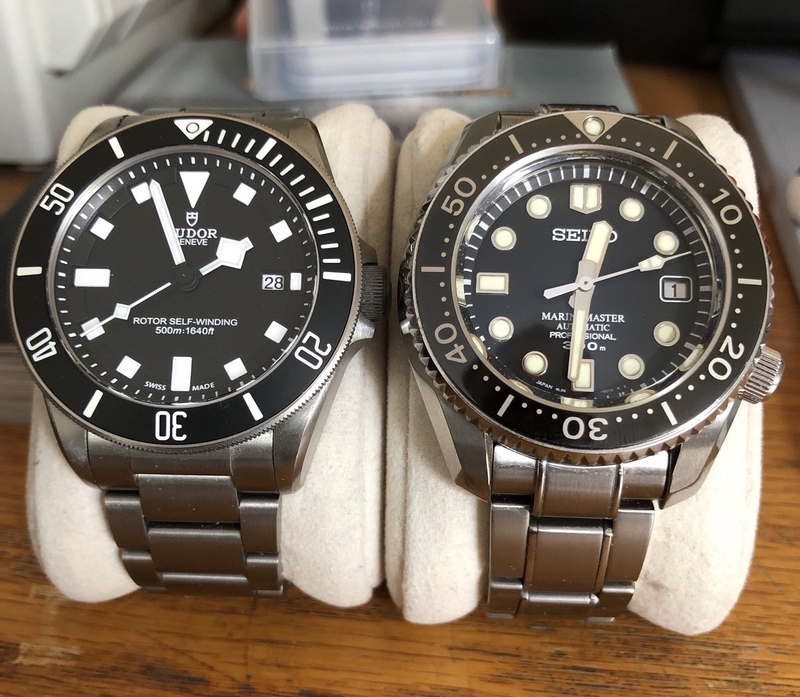 For my serious divers I ended up with a Pelagos and a marinemaster SBDX017 which are both great (still chunky tho) and didn’t have the bracelet issues the omega has (I agree with all your comments on the bracelet, indeed my 42 mm P.O. didn’t even have micro adjustment on the Clasp which I found staggering). But I still browse for the PO from time to time. Sadly I don’t see the 39.5 for sale often at all but I think I will keep looking. danielmewes, GregoryD, Relo60 and 1 others like this. Very good review of a great watch. Enjoy your new Planet Ocean. Great write-up. You make some excellent points which should prove very useful to people who are interested in this watch. Enjoy the PO and try to post some pictures from its first underwater mission. I also have the P.O. 39 but in black. Yours almost looks black to me, is that the standard for Omega's blue? Or does it change in certain lighting? Either way, I found it a bit too thick for me so its on the chopping block. Everything else about the watch is superb, especially the clasp. I gotta say, at first it looked a bit small to me, being the first time I had bought a dive watch under 42mm, but once it was on my wrist I realized it's probably the perfect size for my 6 3/4 inch wrists. I do have a Breitling Superocean Heritage Chrono in 44mm and it's just a tad too large. However, it's a gift and a bit significant one at that, so I will probably keep around. What definitely threw me off too was how the color of the dial/bezel looks like in the Omega website versus IRL. In dark/dim indoors lighting, the bezel and dial look almost grey, and very reflective, but once you're out in the sunlight you can see the blueness a lot better. Also I do agree, that it has quite a bit of shine to the watch, which I do think it makes it look quite interesting, but I can also see how it would be a bit of a turn off for someone looking for something more low key / tool watch-y watch. OP, how long have you noticed the time loss or how long have you had the watch? I ask because my PO8900 also loses 1-2 sec per day and a quick search here resulted in a few others experiencing this time loss with the new movements. It’s a little concerning considering Omega stated this watch should never lose time - their words, not mine. Yeah it depends *a lot* on the lighting. The outdoor shots above show the blue color better. In some light, it turns into more of a grey to dark silver tone. I think it's an effect of the ceramic material being so glossy, but it's definitely a very interesting effect. Which year is yours from? I vaguely remember reading about the pre-2016 39mm POs to be slightly thicker than the newer 39.5mm model.